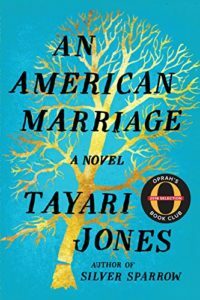 I needed an Oprah’s Book Club book for the Book Riot Read Harder challenge and this one took place in Atlanta so it seemed like a good choice. The novel deals with the false imprisonment of a successful black man and its after effects on him, his wife and his marriage. While this seems especially relevant in today’s context, I was surprised to realize the novel takes in the early to mid 2000’s rather than current day. Ray Jr. grew up in small town Louisiana; while his family wasn’t exactly poor, they worked long hours to send him to Morehouse College in Atlanta. Celestial, his wife, grew up in Atlanta to middle to upper middle class professional parents, and attended Spelman. Even though Celestial and Ray had run into each other while attending their respective HBCUs, it isn’t until years later when they run into each other in New York that the sparks fly and they begin dating. As the novel starts, they have been married for a year and half, and are at the point where they want to have a child. Ray is successful at his corporate job and ambitious, while Celestial, an artist and doll maker, is also starting to see some success. They are a prime example of a couple on the rise doing everything right until Ray is falsely accused of a crime in his hometown while they are visiting his parents. Celestial never doubts his innocence since she was with him when the crime occurred, but he is found guilty in court and sentenced to 12 years in prison in Louisiana. Celestial returns to her life in Atlanta, adding distance to the strain of keeping up a marriage to someone locked away. The novel shifts between the perspectives of Celestial, Ray, and Andre, mutual friend to both though he has known Celestial since childhood. When everything goes wrong, it is Andre that fills in as Celestial’s rock, being a shoulder for her to cry on. Celestial and Ray’s marriage was far from perfect – her parents liked Ray but were not sure if he was right for their daughter, and early on, Ray even admits to still flirting and collecting women’s numbers to make sure he “still had it.” Their marriage was passionate with lots of blow ups, arguments followed by making up. It should not be a surprise that despite the wrong that was done to Ray, it doesn’t take too long for the cracks to show and for Celestial to feel the strain. From Ray’s jealousy and anger of being left out of Celestial’s life when she doesn’t mention him in an interview about her art, to the fact that their plan for children has been put on hold, nothing is simple, and their letters to each other mix between assuring each other of their love, accusations and defensive responses. Without proximity, though, they can never make up the way they used to. After a few years, Celestial declares over letter that she cannot do it anymore. Flash forward a few more years, and Ray’s appeal is finally successful, giving him back his freedom several years early with no idea where to go next with his life but wanting his marriage back. Some aspects of Ray’s personality are very old fashioned, and one of the reasons they didn’t hit it off in college is because he was a bit of a ladies’ man. He is innocent, he has been horribly wronged but Celestial is also an innocent bystander. Does she owe him a second chance? Who is to say their marriage would have even survived if he hadn’t left? It certainly seemed good at the time but things that seem passionate in youth can wear thin with maturity. This novel does not offer easy answers; Ray’s life and original path are destroyed because of a false accusation, and even being released and found innocent does not mean he can pick back up where he left off, especially career-wise. As a result it is not a surprise he clings to the idea of Celestial and his marriage. While all the characters were sympathetic, placed in a horrible situation, is Celestial whom I found the easiest to empathize with. Even understanding Ray’s perspective, his needs and his loss, it seems like he puts too much on Celestial. I doubt I would have picked this up without the Book Riot Read Harder Challenge but I am ultimately glad I read it since Jones does not try to sugar coat or provide easy answers to the readers. Ray wasn’t the only victim when he was falsely imprisoned, but Celestial could at least free herself even if it came with a burden of guilt. Share the post "None of This is Fair"
Damn, this is going to be a frustrating read. Thanks for the heads up! It’s really thoughtful, which helped make it easier to read even as you felt bad for the situation and everyone involved!